What is an Embrace You Group (EYG)? An opportunity to take out the woman you are discovering and show her to others. If you’ve been working on Embrace You and like the idea of building deeper connections with other women, forming an EYG may be just what you’re looking for. An EYG is a small group (2-6) of women who want to practice vulnerability with one another by sharing their answers to the questions in Embrace You. 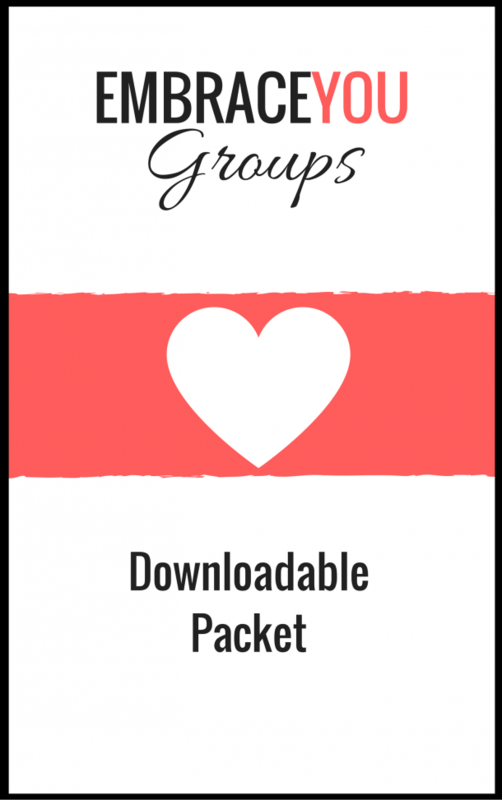 Looking to Start Your Own Embrace You Group (EYG)? You love the idea of asking a few women to join you on the journey of discovering the real you, but what kind of commitment would that be? How does this all work? You’ve decided you want to start your own EYG. Now what? To have the most successful EYG, you’ll want to do these 3 things. You don’t want to skip these. Who do you invite to your Embrace You Group? Kathleen gives you a series of questions to ask yourself to determine who would be the best fit for your new group. You’ve got your list of Heart Holders. Now what? Follow this process to ensure the women in your group are ready for this level of vulnerability; not all will. To ensure an environment safe for vulnerability, your group members will need to understand these guidelines. You don’t want to skip this step!